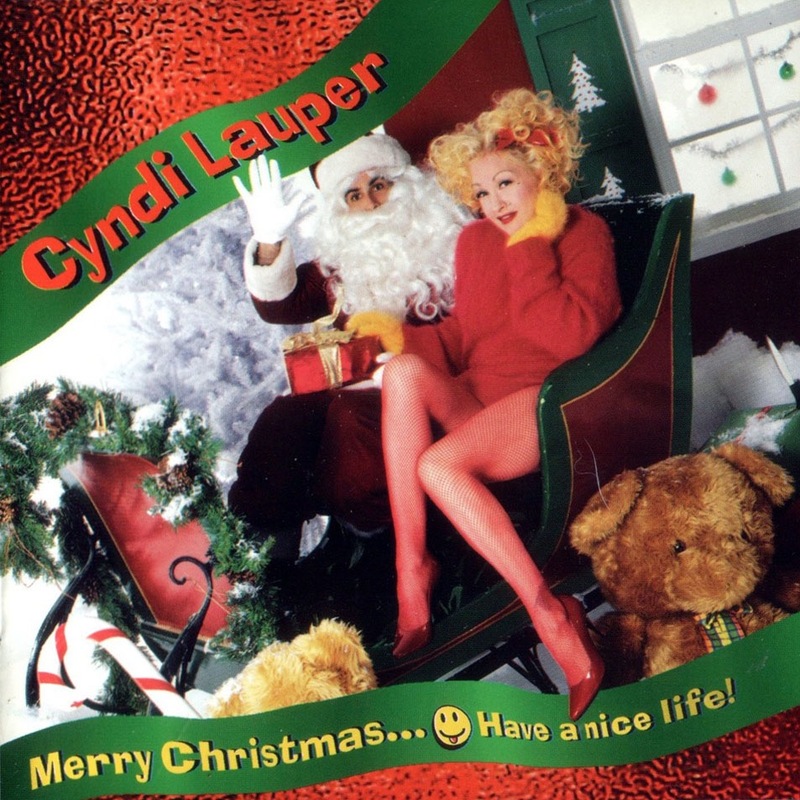 Today’s POP RESCUE is the 1998 Christmas album by Cyndi Lauper titled Merry Christmas… Have A Nice Life! This is my first listen to a Cyndi Lauper album. I’m used to *that* hit single, and that’s about it, so I’ve no idea what i’ll make of this album, let alone it being pumped with Christmas. The 11 track album opens with the first of the seven original tracks – Home On Christmas Day. This opens with guitar, and I soon quickly reminded of the vocals of Allison Moorer and Brendan Benson. This is a nice mellow guitar-lead song, and it’s pretty singalong – aided by the lyrics being printed in the book. Second track, Early Christmas Morning, is another original song, and it’s great to hear it take on what I feel is an essential part of any good Christmas album – children singing. The kids from the Chatterton Elementary School Choir eventually give way to a burst of drums and then Cyndi takes the lead. They return though, as a great backing vocal in the chorus. The lyrics here would not be lost amongst the classic hits from the 60s and 70s. This song was previously available on the Japanese version of Cyndi’s 1996 album Sisters Of Avalon with Japanese vocals, but was released (in the USA) with English vocals as the first and final single from this album. A chirpy melodica opens a bouncy cover of Rockin’ Around The Christmas Tree – and this is a wonderful version. Album co-producer William Wittman is even coaxed into providing backing vocals. Next up is another original track – the fun Christmas Conga – which includes the line ‘bonga, bonga, bonga, do the Christmas conga‘ – what more could you want? The track is laden with synths and a pumping beat, interspersed with accordions, trumpets and trombone. Minnie And Santa is the fifth track, and again, it’s another original. It has a vintage Christmas song tone – both in style, but also in theme – as it reminds me a bit of I Saw Mommy Kissing Santa Claus. Cyndi sings the story of a colleague called Minnie who believed in Santa, despite being mocked by her colleagues. Yet, she ends up being whisked away to the North Pole by him. Silly, but it’s a fun track. Up next is Feels Like Christmas – another original track, but this was previously released on her 1993 album Hat Full Of Stars. There’s plenty of accordions here, pitched alongside beats and guitars. This track was co-produced with producer and remixer Junior Vasquez (John Mellencamp, Cher, Britney Spears amongst others). ‘Clogging’, tin whistles and recorders open next track, the classic Three Ships. I’ve always found this song to be somewhat odd, because it doesn’t really fit in with the Christmas story. That aside, it’s short and sweet, and whilst the music feels somewhat reminiscent of medieval music, Cyndi’s vocals here are more Kirsty MacColl in tone. At little more than 2 minutes, I’m glad this track passes quickly. Another original track, New Year’s Baby (First Lullaby) is up next with some lovely Ukulele playing by Cyndi. This is a really nice song, and it feels fully formed and rounded, with some warm backing vocals. Even her then infant son Declyn gets a starring role, gurgling right on cue, and was probably the inspiration for the song that opens with the line ‘When I first saw you you looked alien, like someone in mid dance, like a little old man‘. I’m sure that inspiration continues (her son was born late November 1997), as synth bells open next track December Child – a simple, beautiful song – again a Lauper original – that acts as a lullaby for a baby. The track is minimal, and this works perfectly, and gives Cyndi a perfect place to show off her gentle vocals. Beautiful. Penultimate track is In The Bleak Midwinter, the Gustav Holst composition based on the Christina Rossetti‘s poem. Here, Cyndi sings beautifully alongside dulcimer and tin whistle – giving a very much school nativity feeling to it, before a warm synths cape joins in as the second verse arrives. Final track, the obligatory Silent Night, see’s Cyndi’s vocals make light, delicate, work of the range needed to sing it. The Chatterton Elementary School Choir returns to add complimentary gentle backing vocals from the second verse onwards, whilst some synths help to keep the whole song woven together. And that’s it! Overall, Cyndi’s Christmas is quite a fun range of songs, and to her credit, the original songs out-number the classics here. Whilst some sound a bit dated like Christmas Conga (although maybe that was the point? ), I’ve been delightfully surprised at just how listenable this album is. The use of simple, traditional instruments alongside synth instruments helps to connect old with new, and also give a strange comforting ‘school nativity’ feeling about it all. Where is Cyndi Lauper now? Shortly after this album, Cyndi joined Cher as the opener for Cher’s Do You Believe? Tour, and also began starring in a number of TV shows (The Simpsons) and films. By 2001 her next album was ready, but was almost shelved when her label went bankrupt. The album was released in Japan, where she continues to have a large fan base. Cyndi has remained an LGBT right supporter throughout her career, and has also undertaken many charitable acts to support those living with AIDS. She set up the True Colors Fund to promote equality, and more recently, she was an advocate of the Hate Crimes Prevention Act in the USA. 1998 UK CHART POSITION: Did not chart in UK. POP RESCUE COST: £2.67 from eBay. Posted in 1990s, Christmas, Cyndi LauperTagged 1998, album, Chatterton Elementary School Choir, Christina Rossetti, Gustav Holst, Junior Vasquez, Merry Christmas... Have A Nice Life!, review, William Wittman, xmasBookmark the permalink.